"There's no startin' over for me." Tennessee Ernie Ford lends his voice to the theme song of this unusual 1957 western directed by Henry Levin (Journey to the Center of the Earth). 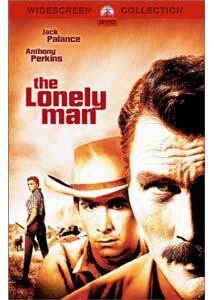 The Lonely Man breaks from western tradition as more of a character piece than action film, likened to Shane or Unforgiven on the packaging; unfortunately, there is little in common with these classic pictures. If it weren't for the leads' more notable performances elsewhere, this one would have vanished into obscurity. Jack Palance stars as Jacob Wade, an aging gunman with a long and bloody history, who is trying to make amends for his past. Returning to his former home, he finds his estranged son (Anthony Perkins as Riley), whom he hasn't seen since he was a young boy. Riley has a huge chip on his shoulder when it comes to his father, holding Jacob responsible for his mother's suicide. Jacob is determined to settle into an honest life and get on the boy's good side before he dies, an event which seems to be looming near. Despite his wishes to become respectable, the ghosts from Jacob's past return to haunt him. The townfolk want nothing to do with him and turn him away, and his old gang, led by the vengeful Blackburn (Claude Akins), is looking to kill him. When the pair wind up at the ranch of Jacob's former mistress (Elaine Aiken), she tries to help reconcile them, but instead becomes another part of their discordant relationship. Can Jacob win his son's affection before it's too late? The story is a classic tale of redemption, and does have an unusual twist in the end, but only after many missteps along the way. Action is limited, favoring the character development, but even with the increasing backstory, things just don't quite pan out. The cast turn in rather unispired performances, with Palance becoming an apologist, and Perkins acting like a whiney, spoiled child, unable to forgive his father for abandoning him—except when he's hitting on daddy's love interest. The direction is uneven, often building to what should be a climactic moment, only to drift into some emotional netherworld instead. Shot in Lone Pine, California, the cinematography is the one strong point, with some beautiful panoramas. The guest list reads like a western who's who, however these faces come and go without consequence, leaving the end result here dry as a dustbowl, with little to leave a lingering impression. Image Transfer Review: Paramount has done a fine job with this film, giving it an exceptional widescreen transfer. The black-and-white image is clear and crisp, with a nice grayscale, and good contrast. The print is clean, with few defects. Detail level is fine, there is some minor aliasing at times, but overall this looks very good. Audio Transfer Review: Mono audio is very good from a technical perspective. The sound is well balanced, hiss or distortion is nonexistent, and there is nothing else of note in the way of defects. Dialogue is clear and easy to discern. Extras Review: Aside from the ten chapter stops, this disc is barren as the rolling countryside. Paramount has done a respectable job with its presentation of The Lonely Man. The film tries to tread different ground with its tale of redemption, but with somewhat flat performances and an awkward script, doesn't really work. As a western, it is pretty run of the mill, but is still okay as a rental for those curious about its stars. Perhaps Perkins works better with his mom.